Claws ability (FormID 000aa01e): Khajiit claws do 12 points of damage in addition to their base damage value of 10 points for unarmed combat. Although the in-game text says "Khajiit claws do 15 points of damage. ", the actual effect magnitude is only 12 points. The game data also describes the effect as "Khajiit claws do four times the damage of a man's punch." Night Eye lesser power (FormID 000aa01d): Improved night vision for 60 seconds, multiple times per day. Fortify WarmthCC (FormID FE000872): Your Khajiit blood improves your resistance to cold environments by 15 points. Raw DietCC (FormID FE000877): Your Khajiit blood allows you to eat raw meat without risk of disease. Khajiit, like Argonians, make good thieves due to their bonuses in skills typically associated with stealth-oriented classes. Night Eye is a handy lesser power while dungeon-crawling or for seeing at night, when many thieves do their work. Their claw bonus helps in brawls, and, combined with the Fists of Steel perk, makes unarmed combat viable. In combat, players have the opportunity to take advantage of the Khajiit's bonuses to one-handed and ranged weapons, and their strong bonus to Sneak makes sneak attacks accessible at early levels. Khajiit may be taunted with "You'll make a fine rug, cat!" and "You remind me of my cousin's cat. Killed that too!" in combat. Upon finding a dead body they may also say "I'll claw the eyes out of whoever did this!" The Khajiit Claws racial bonus to unarmed damage stacks with other sources of damage increase, such as perks like Fists of Steel and equipment like the Gloves of the Pugilist. 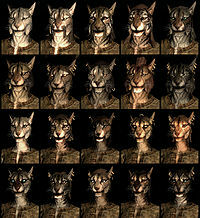 As Khajiit lack the relevant dialogue, you cannot marry them even through use of the console, although it can be utilized to transform a marriageable NPC into a Khajiit. If the player is a Khajiit, marriage is still possible with any marriageable NPC. Khajiit tails may sometimes continue to move after death. This is more common with dead bodies that were put in areas for show, such as finding a dead body in a jail cell in a dungeon, and not as common with actual NPCs that are killed. Tails of the player continue to move after death on frequent occasion. Khajiit tails may sometimes stop moving at all after death, freezing in the place where they were in the moment of death. This page was last modified on 3 June 2018, at 13:08.